This is the famous Colby WalkMac that was on the cover of all the magazines. 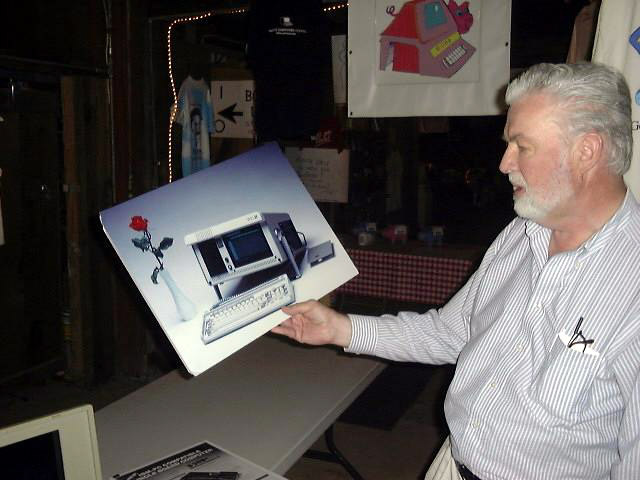 Customers ranged from the Greatful Dead rock band to Peter Jennings of CBS news It was the first battery powered Mac and the first portable Mac with an LCD display. 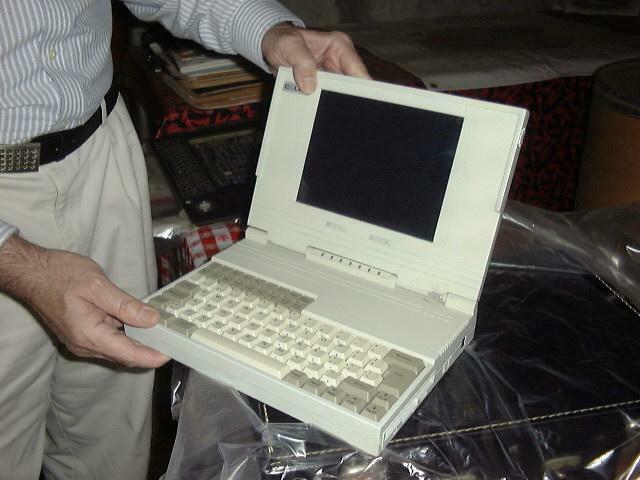 Many thousands of these were sold from1987 to1991, and before Apple came out with their portable, when anyone called Apple in search of a portable Mac, Apple gave them Colby's Phone number. 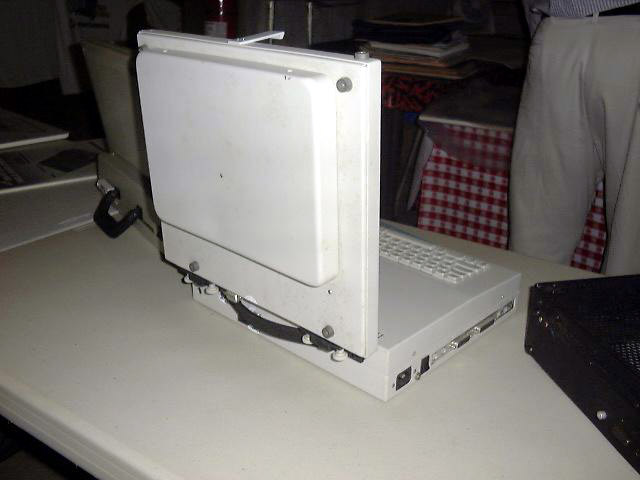 Even when Apple came out with their portable, the WalkMac SE 30 continued to sell well because the first Apple Portable was way underpowered compared to the WalkMac SE30, which was based on the Mac SE 30 motherboard. 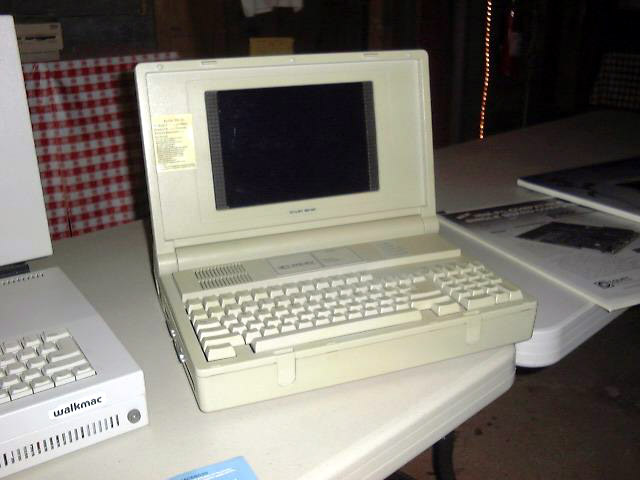 The name was later changed to Colby SE30 after Sony threatened to sue over the name WalkMac because they said it was too close to Walkman. 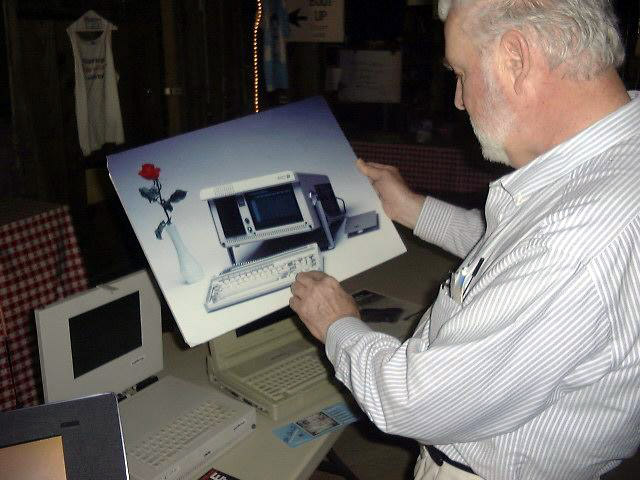 ...It was first introduced in 1986 and then later upgraded to the WalkMac SE30 when the Mac Se30 came out. 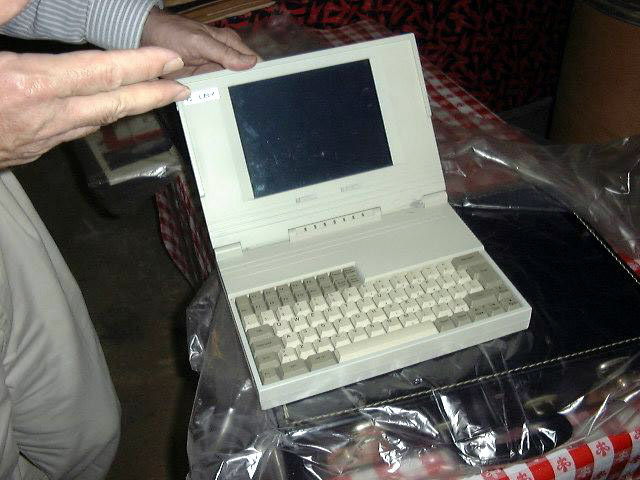 Wooden mockup of the canonical modern laptop (circa 1982). Another view of the mockup. View of the mockup folding shut. 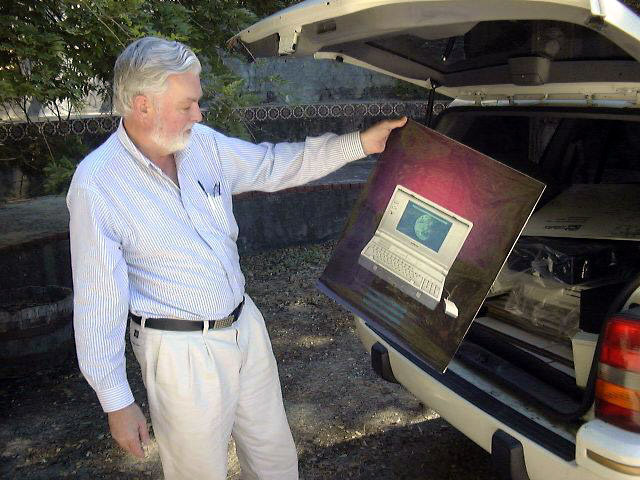 ...By unplugging the back-light unit, you could set the display on an overhead projector and project the screen image onto a large screen. This was later patented (wrongly) by someone from Taiwan. 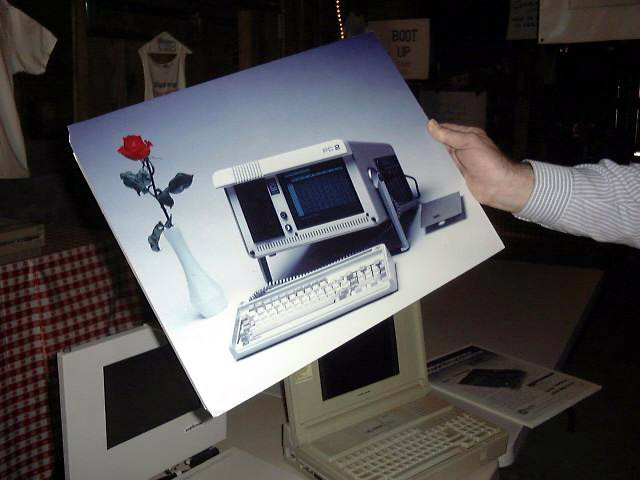 This is the first Mac that used a plasma display(1985). 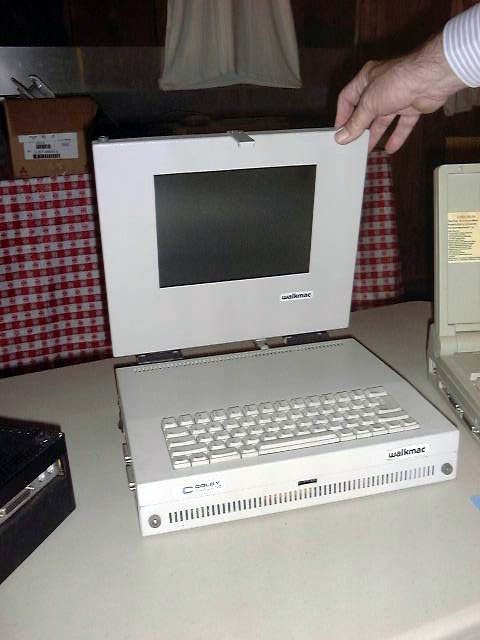 It had two built-in floppy drives. 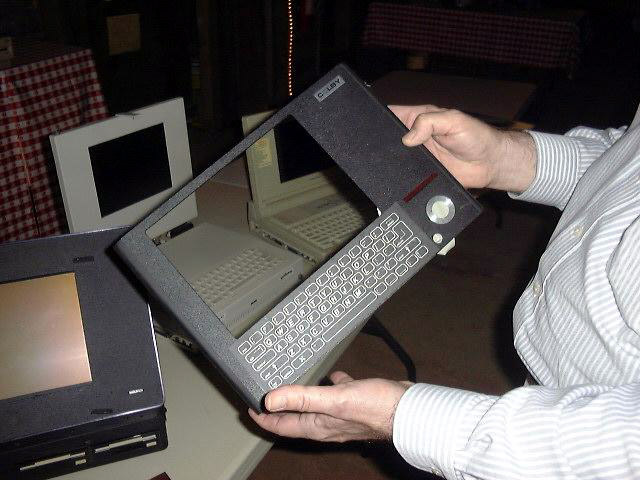 This is the front bezel of the Colby Classmate, the first Mac Compatible tablet computer. 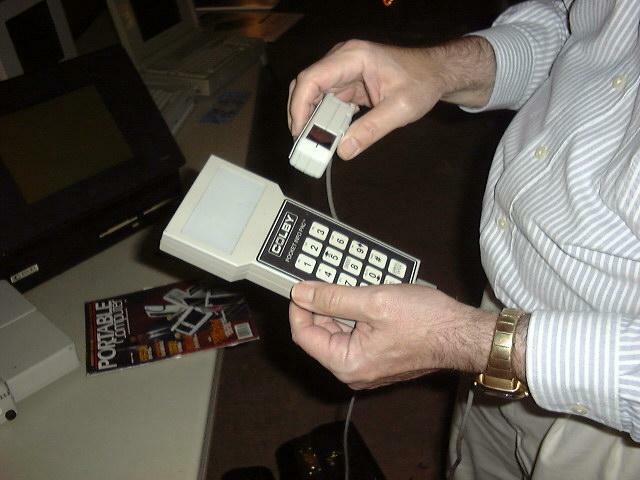 ...Our design was much more integrated than the IBM design. 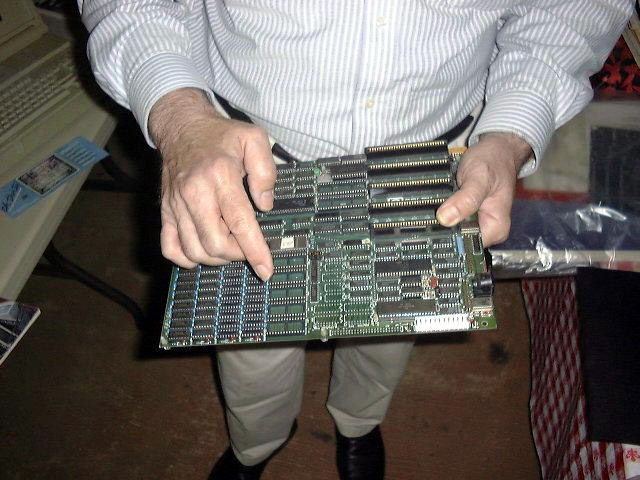 We were able to all put the functions on the motherboard that IBM required the motherboard plus four slots to do to make a working computer. We had everything but the video display driver on the motherboard, so we had four empty slots left for future expansion. 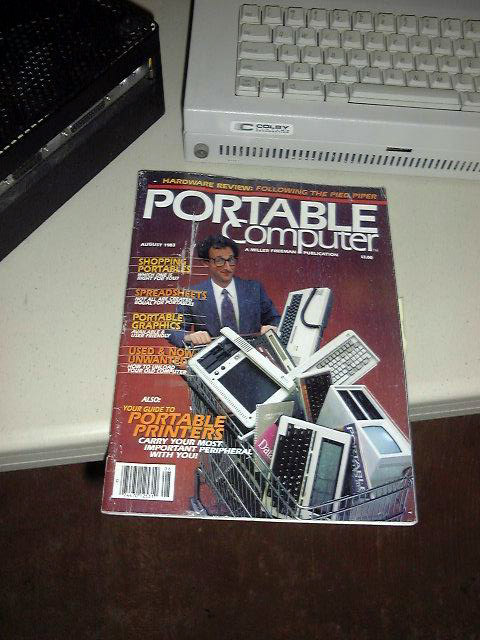 This cover of the magazine showed all the portable computers that were available as of 1982. 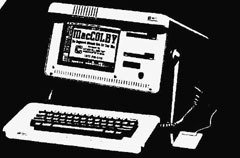 The only one in that picture that was Microsoft DOS compatible was the Colby. 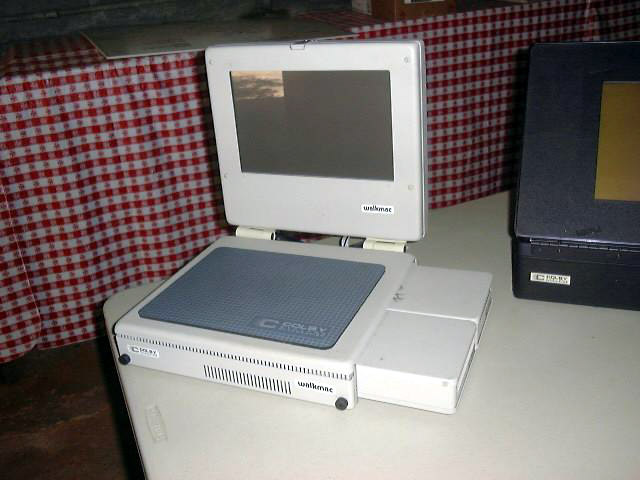 PS-2, as everything else ran CPM. 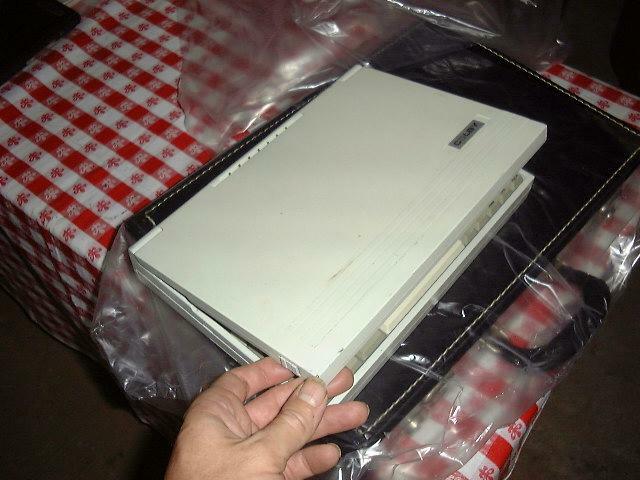 (Compaq was not yet even in business at this time). 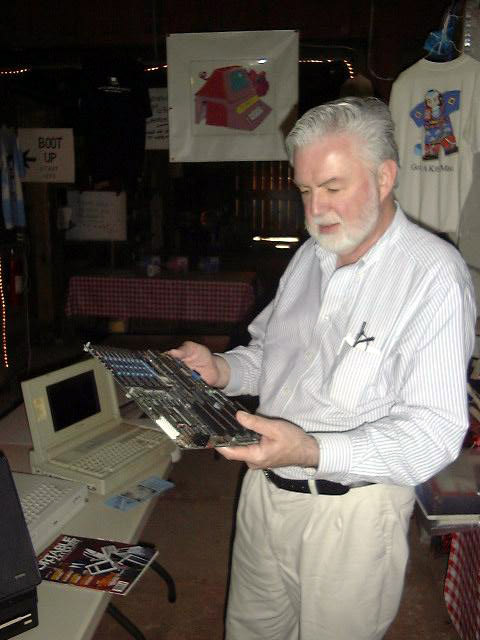 Chuck and the portable DOS machine. 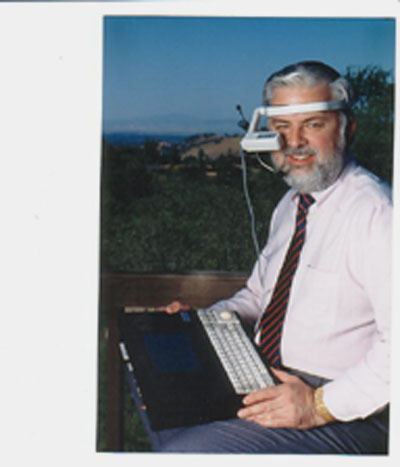 ...The display was made by a company called Reflection Technology and consisted of a vibrating mirror that scanned a led into your eye to let you see the computer display. It worked amazingly well. 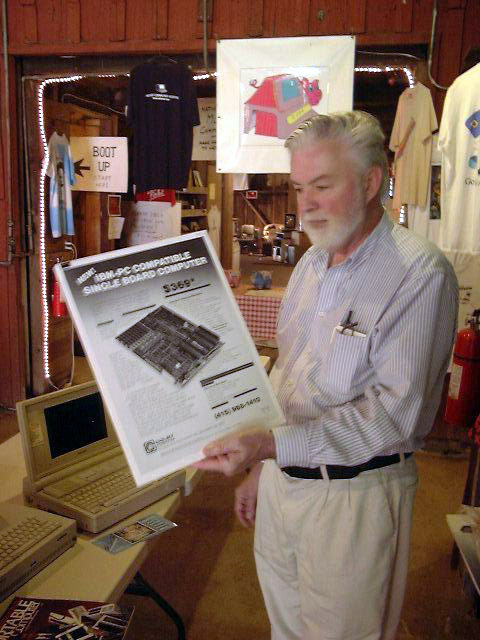 The operating system was developed by Colby and predated the Palm OS by 5 or 6 years. Chuck examing Daniel's portable musical computer. 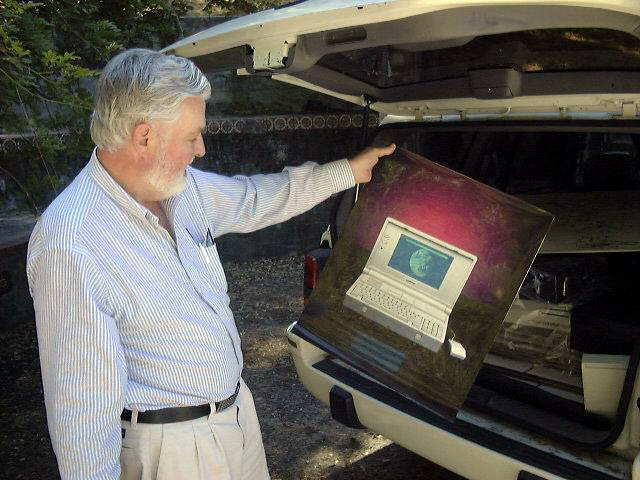 The Colby Tablet Mac in action! 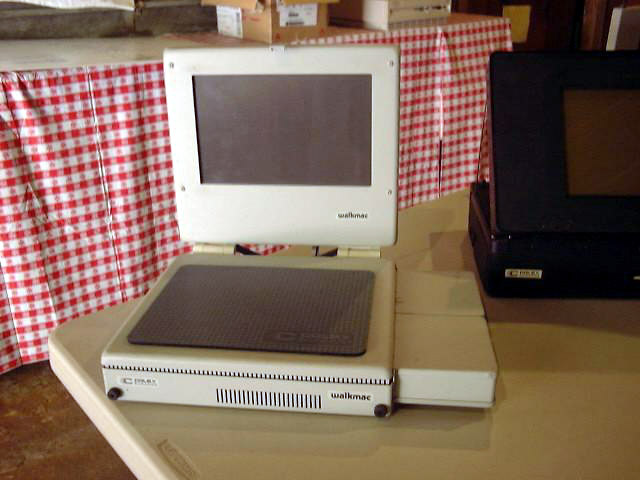 The TabletMac was the first slate-type Mac. 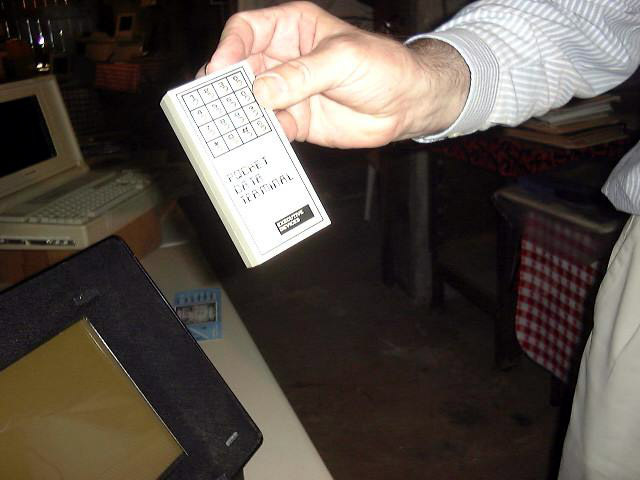 It had a LCD display and also supported a Heads-Up display (another first). 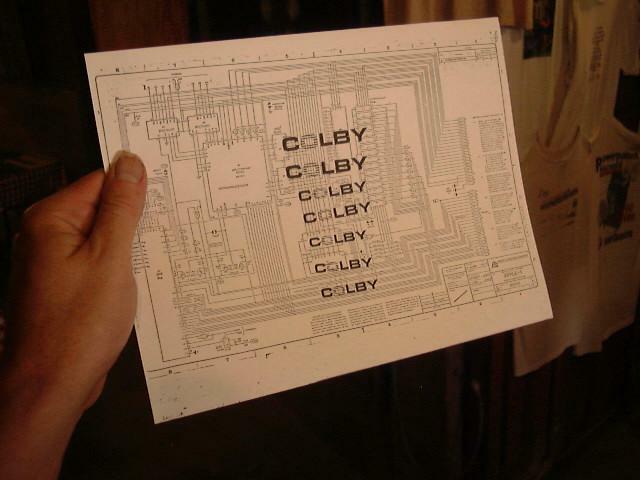 It was also called the Colby Stealth Mac. 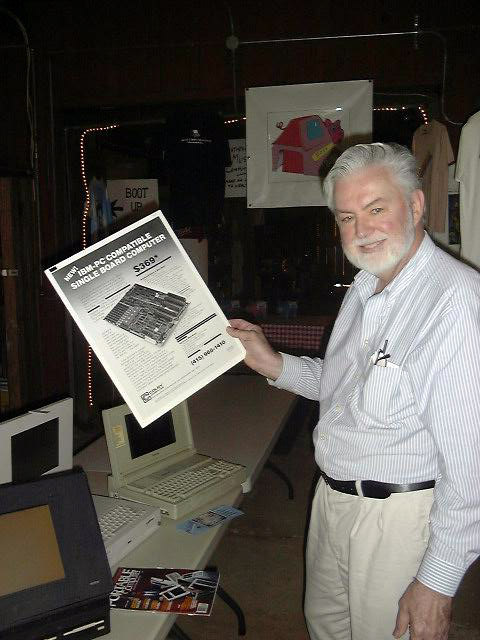 Chuck notes; Woz passed this out at one (only) Homebrew meeting. 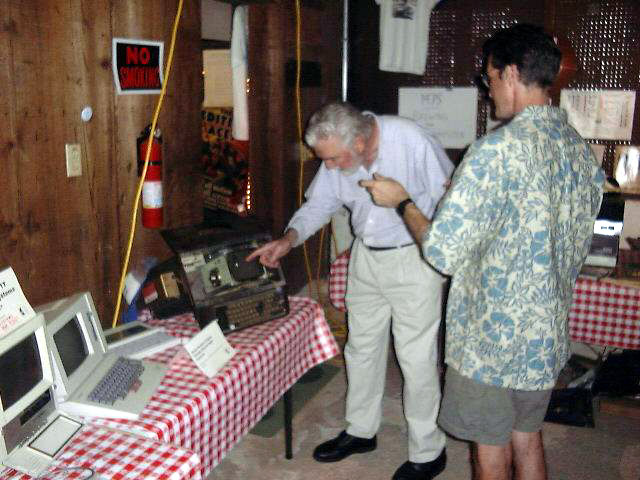 Colby won the top 10 award for the National Association of Broadcasters Show for that first MPEG-1 Digital Video Recorder in 1994 and then won again in 1996 for the development of the first MPEG-2 Digital Video Recorder. 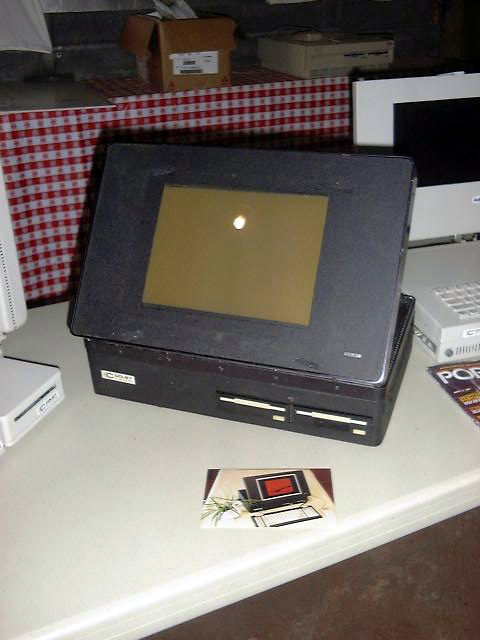 Reflection Technology was our biggest customer for the unit, called Colby Pocket Info Pac or PIP. 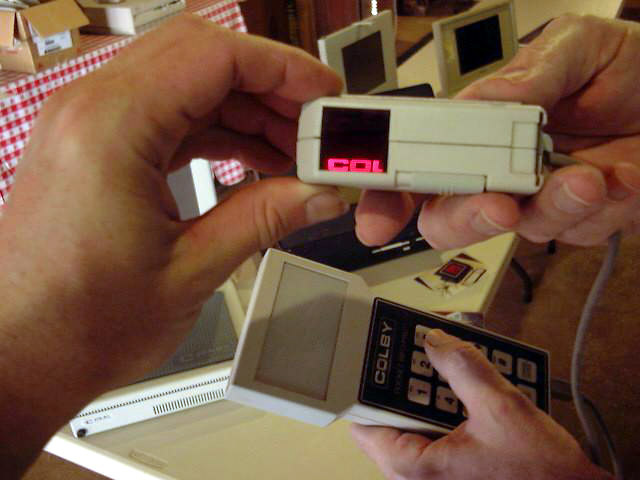 They sold them to potential customers that were interested in evaluating their display. 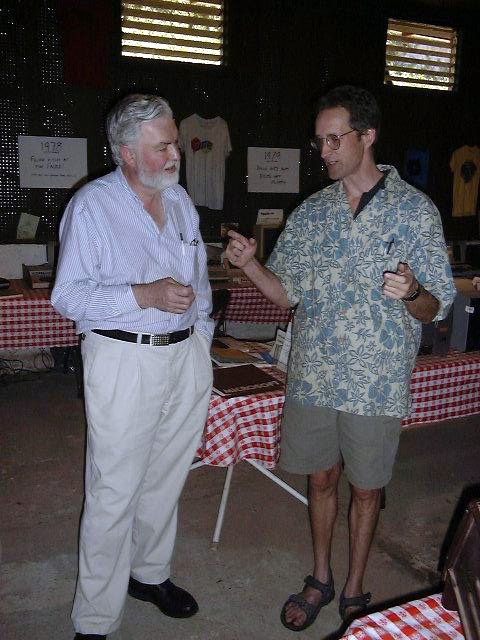 Later, we interfaced the diplay to a Mac, and actually built a wearable Mac (another first).